"The compelling story, direction, and performances are supported by an eerie and effective design, with a haunting soundscape by Randall Benichak and dramatic lighting by Yi-Chung Chen that signal the shifts of scenes from Mina's dark and bloody recollections to her well-lit room in the hospital." "Additionally, the marriage of Yi-Chung Chen's lighting and Randall Benichak's sound designs are both hypnotic and unnerving, ever dancing across the line between reality and nightmare." "Your Invisible Corset thrusts us into world with jarring speed and rapid scenic shifts, embellished by lighting designer Yi-Chung Chen's ominous reds, dreamlike washes, and dramatic strobes and blackouts. "It is not easy to pull off horror onstage, but this production, aided by effective lighting and sound design, succeeds in maintaining an atmosphere of tension and intensity, as well as, significantly, in having the audience experience some of same sense of disorientation that Mina is feeling. "The sound, lighting, and set design of Your Invisible Corset are all simple and sharp yet astonishingly effective. As a result, the intimate space of the Flamboyan Theatre has never looked better or more utilized." "Yi-Chung Chen's lighting design helps with the central themes about dreams." "The score - imaginatively featuring the harpsichord - and the fine lighting accentuate the airy sense of happiness." ​"It's a journey augmented by the less-is-more, action-packed staging of director Brendan Burke, which includes such imaginative touches (by set designer Joah Christensen and lighting designer Yi-Chung Chen) as using a shimmering white curtain and dim and bright lighting to modulate moods and scenes." 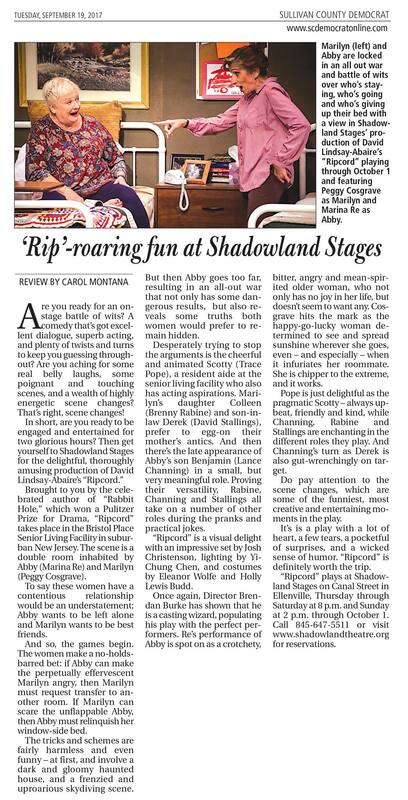 "Ripcord is a visual delight with an impressive set by Josh Christensen, lighting by Yi-Chung Chen, and costumes by Eleanor Wolfe and Holly Lewis Budd." "... under Yi-Chung Chen's dreamlike lighting." "Yi-Chung Chen successfully crafts environments that flow from a stormy night, to a calm yet foreboding morning." "... a gorgeous lighting design by Yi-Chung Chen, signifies the transition between the two story lines." "... Yi-Chung Chen's lighting design is crisp." "... the evocative lighting by Yi-Chung Chen."